If there’s anything you can say about the Nintendo Switch, it definitely isn’t that it doesn’t have plenty of 3rd-party support. And just like that, the system picked up yet another AAA title. Coming to the Switch this Summer 2018 is Ys VIII: Lacrimosa of DANA. The last title featuring everyone’s favorite wandering swordsman, Adol Christin. Set for a June 26, 2018, release date, there hasn’t been any mention of the price just yet. The Switch version of Ys VIII: Lacrimosa of DANA will include the same content from the PS4 and PS Vita versions. 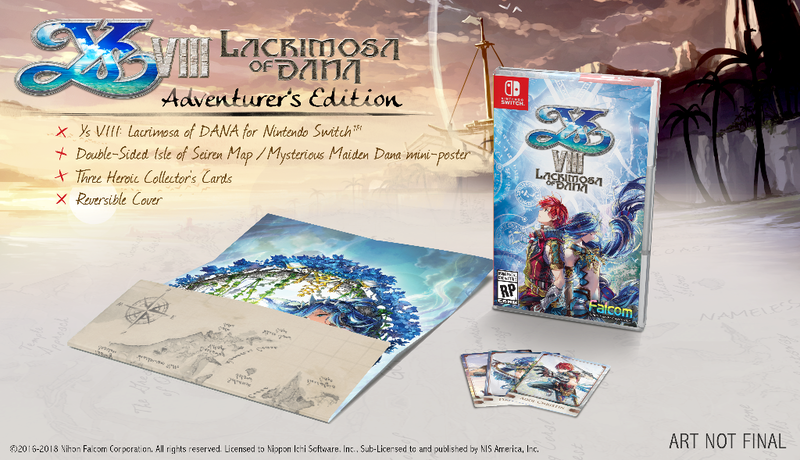 As well as a bonus in the form of the “Day One Adventurer’s Edition” – a reversible cover, exclusive foil pack of three cards and a double-sided poster showing off both Dana and the Isle of Seiren. Seeing how the PS4 version is already an amazing title, I’m looking forward to the Switch version. I’m curious to see if the game will retain the same resolution (1080p) and will be able to run at same framerate with or without any quality loss. Guess we’ll find out and we’ll be sure to do an impressions piece, where we compare this to the PS4 version.